How do you measure a chemical in the ocean that exists for less than a minute? This was the conundrum facing Colleen Hansel, a scientist at the Woods Hole Oceanographic Institution (WHOI). She studies superoxide, a molecule so unstable that it reacts almost instantly with other molecules around it, vanishing in about 30 seconds. Bringing water back to the lab simply didn’t work. Any superoxide in it would be gone long before the water could be tested. For years, scientists had measured superoxide in experiments using pumps and a benchtop instrument in the lab designed for the task. However, that device was not built to be used in the field. Superoxide had never been directly measured in the ocean. Superoxide molecules are an accidental byproduct of breathing. They are ubiquitous and highly toxic. Any living organism that breathes oxygen creates them, and then needs to dispose of them quickly. To create energy, cells extract electrons from fats and carbohydrates and transfer them to oxygen. When an oxygen molecule grabs four electrons, it then combines with hydrogen to form water. But this process can be sloppy, particularly when organisms are stressed. Sometimes, oxygen only takes one electron. This makes superoxide. The extra, unpaired electron makes superoxide highly reactive. It either wants to lose or gain another electron to become more stable. To do that, superoxide gives or takes electrons from other cells, setting off destructive chain reactions. Superoxide has been linked to harmful impacts ranging from cancer to premature aging in humans. Ocean scientists also suspect that superoxide might be involved in coral bleaching—the phenomenon that occurs when the symbiotic algae that live inside corals (giving them food and their vibrant colors) suddenly depart, leaving corals pale and vulnerable to starvation, disease, and ultimately death. But a link between superoxide and coral bleaching has only been indirectly inferred from studies in the lab. If Hansel couldn’t bring the samples to the lab, then she had to bring her lab to the samples. 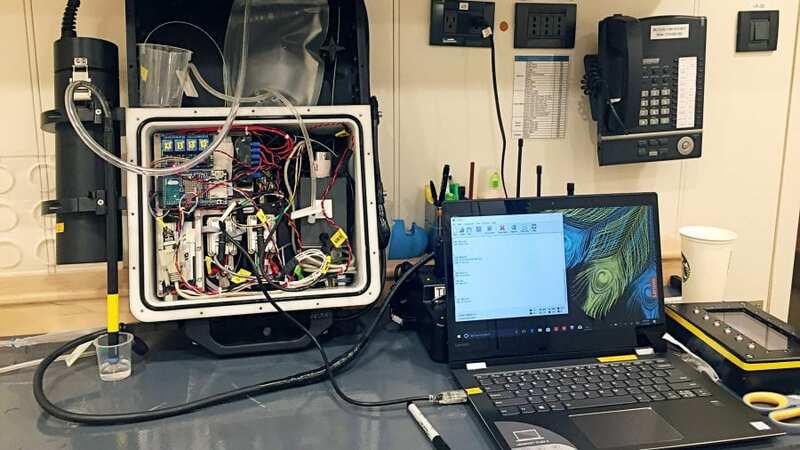 “We said, ‘Let’s just take this lab benchtop instrument out onto a small zodiac on a local pond to see if we can make measurements and hope that we don’t tip the boat over,’” Hansel said. In 2012, she and a postdoctoral scientist in her lab at WHOI brought their lab instrument out onto Oyster Pond, a large, brackish pond on Cape Cod. They knew bacteria in the water produced superoxide, but could they pump the water fast enough into the instrument on the boat to capture it before it reacted away? If the water pumped into the instrument too quickly, the sensor wouldn’t have enough time to make a measurement. If the water moved too slowly, the superoxide would be gone. It was a complicated operation. They lowered a weighted tube into the water connected to a pump to draw samples up to the boat. As those waters fed into the sensor, a second pump pulled in a chemical from a separate bottle that specifically binds with superoxide. Once it was analyzed, the waste water was collected through a third tube, while the data was sent to a laptop via Bluetooth, where Hansel could see it in real time. The whole system was connected to portable lithium batteries—also balanced precariously in the zodiac. And it worked. The setup was unwieldy, and if the tube went too deep, the superoxide would be gone before it made it to the instrument on the surface. But it worked: Hansel had proved it was possible to measure superoxide in situ outside the lab. This presented an opportunity that Hansel and her WHOI colleague, Amy Apprill, had been waiting for. 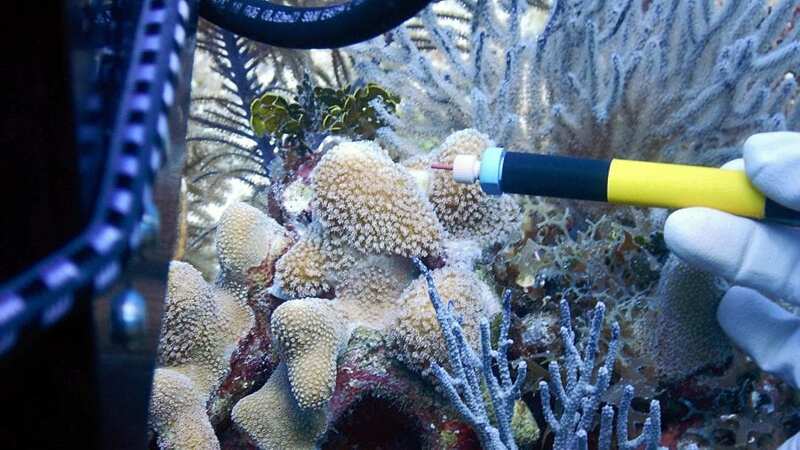 They now had a tool to measure superoxide around corals in the wild to explore its role in coral stress and bleaching. 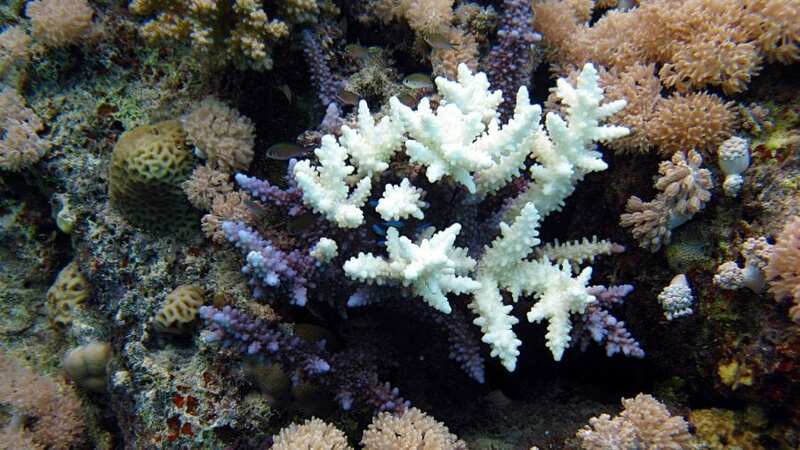 They finally got their chance in 2014 when widespread bleaching occurred in shallow corals in Hawaii. The fall of 2014 was a bad time for coral in Hawaii. The weather was unusually warm and prevailing winds, which usually pushed cooling open-ocean water toward shore and over coral reefs, died down. Coastal water temperatures in Kaneohe Bay, on the western side of Oahu, rose into the high 80s. More than three quarters of the dominant corals on the Kaneohe reef had bleached. The theory behind coral bleaching is that superoxide builds up inside corals in response to heat stress and causes them to eject the algae they rely on. 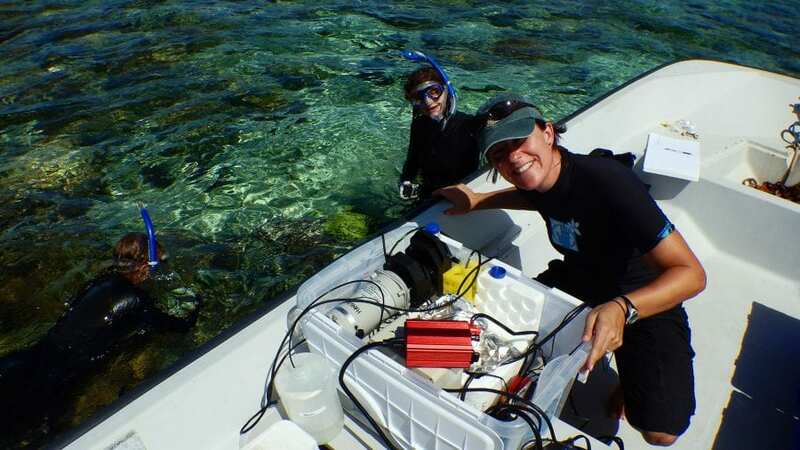 But as Hansel and Apprill loaded their setup into a small rented boat, they weren’t planning to measure the superoxide inside the corals. They wanted to know whether the corals were producing superoxide outside their cells in the surrounding waters. They had seen this behavior in corals growing in aquaria in the lab. But were they doing it in the wild as well? 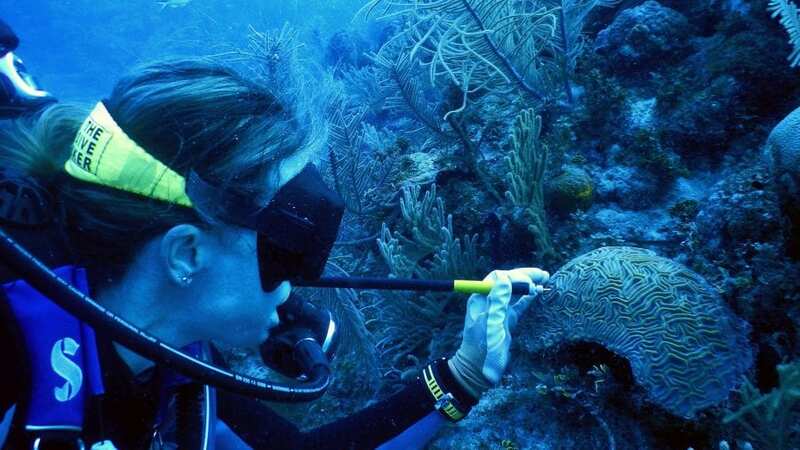 But when the first measurements started coming in, from a resilient coral species known as Porites compressa, they showed that the corals had high levels of superoxide surrounding their colonies. Hansel couldn’t contain her excitement. Several more days of sampling began to reveal a pattern: Hardier coral species, the ones more likely to recover from coral bleaching or avoid infections, had more superoxide around their colonies. More fragile species had less, or none at all. Clearly, there was more to the superoxide story. Perhaps superoxide could be beneficial to corals as well. To see if these results were part of a larger pattern, Hansel would need to test other, deeper reefs. 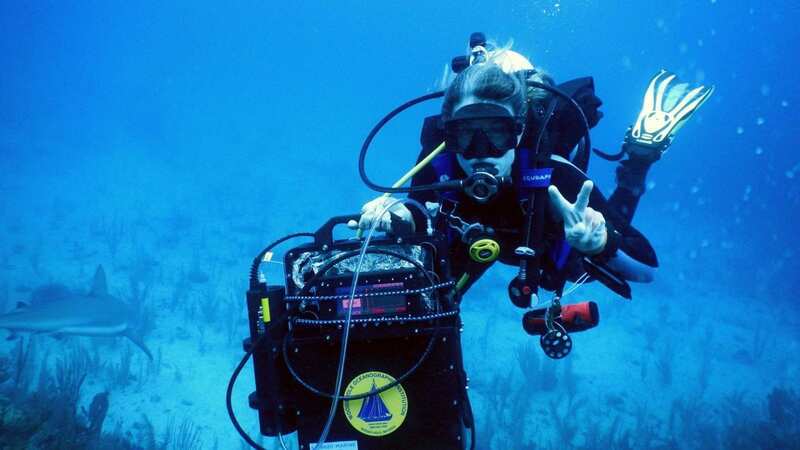 The reefs in Hawaii were shallow, allowing Hansel and her team to pump water to the instrument set-up in their boat before the superoxide vanished. She needed a better tool. “After Hawaii, I knew that I wanted to make an in-situ instrument,” Hansel said. Back in Woods Hole, Hansel started brainstorming ideas with WHOI biogeochemist Scott Wankel. Wankel had experience building deep-sea sensing instruments for exploring hydrothermal vents on the seafloor. The two scientists have been married for 11 years. 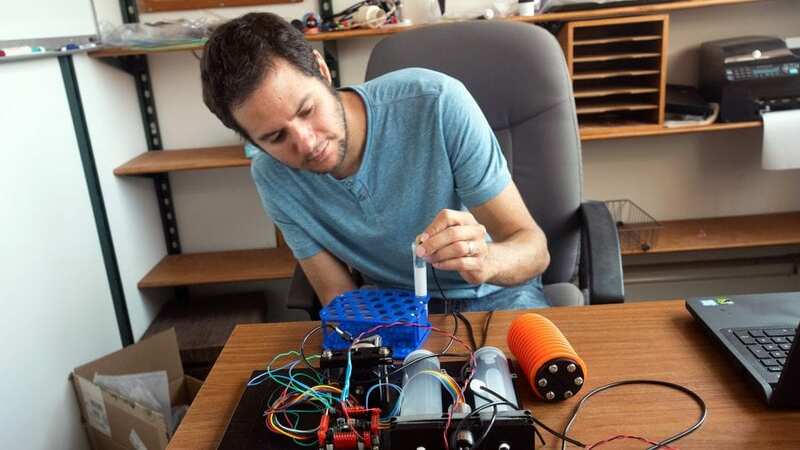 Together, over a year’s worth of Saturday morning coffees, they began to design what would become the DISCO: a portable, underwater, superoxide detector. DISCO is short for DIver-operated Submersible Chemiluminescent sensOr (“We cheated on the acronym a little bit,” Wankel said.) It’s a device the size of a small suitcase, controlled by a handheld screen with five buttons and real-time read out display. It is a hefty 60 pounds in air, but neutrally buoyant in water and can operate to depths of 100 feet (30 meters). The basic mechanics of the DISCO are similar to the lab instrument. Water is pulled inside through a long, thin wand and mixes with a chemical that reacts with superoxide in a mixing cell to produce light that is detected by a photomultiplier tube. The amount of light detected is translated through a small computer to show how much superoxide is in the water. The DISCO had to be built out of inert materials such as certain plastics, ceramics, or glass that superoxide can’t react with—nothing metal. These parts can be found, but they’re highly specialized and typically not made for underwater use. Wankel reached out to WHOI engineer Jason Kapit, who he had worked with on several other projects. “Jason is a master of perusing the literature to find parts and pieces we can use,” Wankel said. Eventually he found parts from inert benchtop chemistry pumps to pull in seawater and intravenous bags from the medical industry to hold the necessary chemicals. These, along with a small computer, a lightproof chamber, and various other components were packed into a waterproof, pressure-bearing case. Hansel had been invited to bring the DISCO on a joint U.S.-Cuban expedition to the Gardens of the Queen reefs in Cuba in October 2017. The expedition, led by Apprill, was aboard the research vessel Alucia. The group had hoped to finish the DISCO in time to test it locally, but design and construction took them longer than expected—into the fall of 2017. 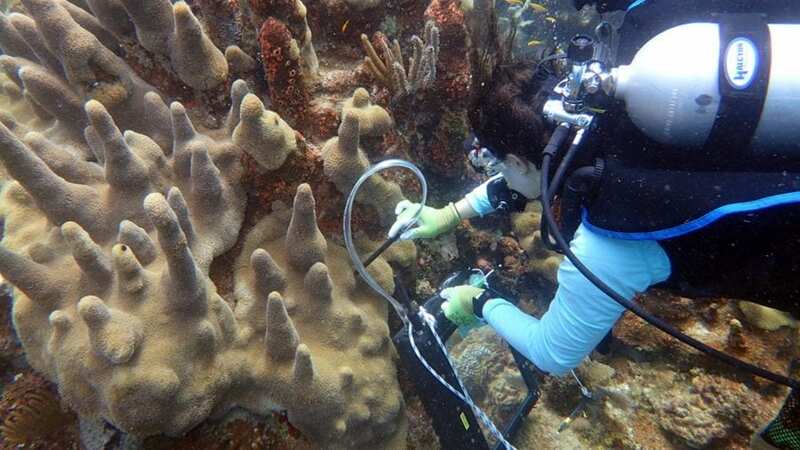 The trip to Cuba was an opportunity to see if coral species in a healthy Caribbean reef were producing superoxide like their stressed Hawaiian counterparts. That information could lead to a better understanding of the role of superoxide. But getting the data was entirely dependent on the unproven DISCO actually working. Scott Wankel knew there were a lot of things that could go wrong. Hansel wasn’t even going to be the one to first test the DISCO in the ocean. Her graduate student, Kalina Grabb, was joining the boat in Cuba two weeks before Hansel. It wasn’t entirely smooth sailing. The pumps ran too hot and caused the readout screen to overheat. Flying blind, they collected data from a variety of coral species. When they were able to view it on the computers, it matched up with what they had previously seen in Hawaii and in the lab experiments. If the most resilient corals are producing the most superoxide, maybe superoxide isn’t all bad for corals. Perhaps the layer of superoxide on the outside of corals provides some kind of protection for stressed corals, like fending off viruses or bacteria that might otherwise infect them or helping with tissue repair. This would be similar to what scientists have observed in other forms of life, such as plants and fungi, and even mammalian cells. To answer this question, the team began working on a smaller, lighter version of the DISCO. Kapit took the lead on incorporating smaller, more efficient pumps to avoid overheating, a sleek touchscreen screen for the diver, and other improvements. He also eliminated machinery humming that emanated from the original DISCO, which attracted curious wildlife. Grabb field-tested the new DISCO in the Caribbean over six weeks in the summer of 2018. 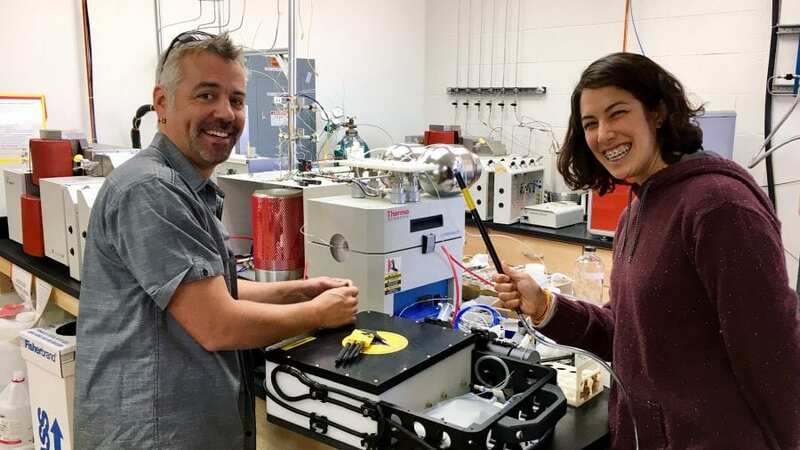 The team is also working on a project called the SOLARIS (Submersible Oceanic Luminescent Analyzer of Reactive Intermediate Species), a superoxide detector that can be used at deeper depths and could be incorporated into a deep-sea sampling platform such as WHOI’s submersible, Alvin. SOLARIS will allow the team to better understand superoxide’s role throughout the ocean. In addition to coral bleaching, superoxide has been implicated in harmful algal blooms and fish kills associated with red tides. But based on lab experiments, Hansel and colleagues have an emerging theory that superoxide is important, perhaps essential, for cell growth in bacteria and phytoplankton. This research was funded by Schmidt Marine Technology Partners and the National Science Foundation’s Division of Ocean Science. Superoxide has been linked to bleaching in corals—when symbiotic algae that live inside corals suddenly depart, leaving corals pale and vulnerable to starvation, disease, and ultimately death. But studying the phenomenon has been stymied by an inability to measure superoxide in the ocean. Kalina Grabb, a graduate student in the MIT-WHOI Joint Program, field-tests a new, lighter and improved, second-generation model of the DISCO in the Caribbean Sea in the summer of 2018.